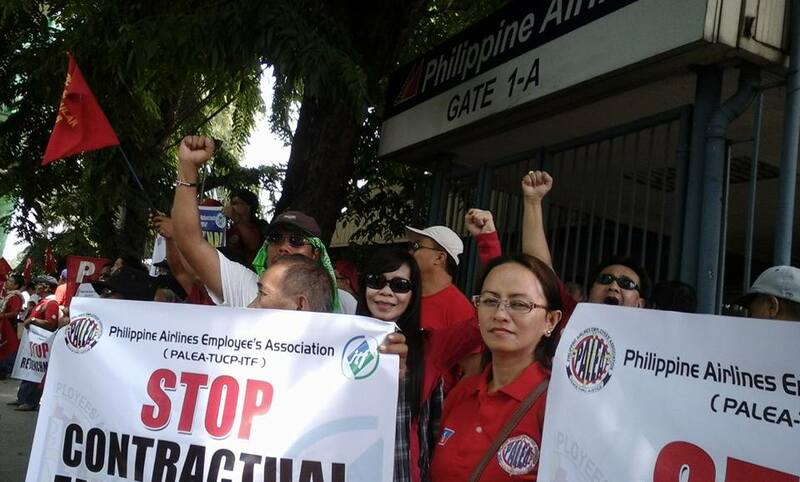 The union Philippine Airlines Employees Association (PALEA) slammed the planned mass layoff at Philippine Airlines (PAL). Today PALEA is holding a protest at PAL’s offices near the airport, which comes on the heels of another last Tuesday. Last week PAL announced the retrenchment in November of 117 employees all working at domestic airports all around the country. “PAL sent a formal notice of separation due to redundancy to PALEA last September 2 to inform the union. Yet no redundancy will happen since the workers to be retrenched will be replaced by employees from so-called service providers. In some airports, employees served by the notice of separation were immediately replaced by contractual workers The new round of layoffs is another wave of contractualization, changing regular unionized workers with contractual employees using manpower agencies,” insisted Gerry Rivera, PALEA president and vice chair of the militant Partido Manggagawa (PM). 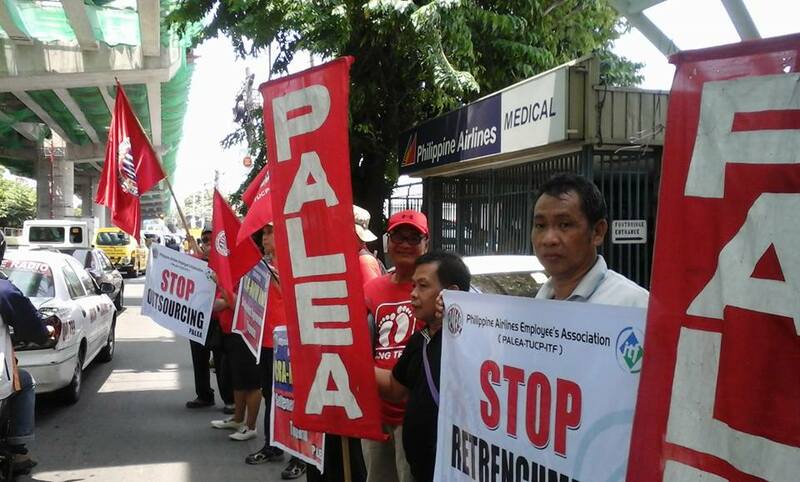 In last Tuesday’s protest, dozens of PALEA members picketed PAL offices in Nichols at the Airport Road and PNB at the Macapagal Boulevard. Aside from blasting the latest layoffs, the PALEA protesters also called for the opening of collective bargaining negotiations and the full implementation of a settlement agreement that ended the dispute over the last mass retrenchment in 2011. No collective bargaining negotiation between PAL and PALEA has happened since 1998 when a 10-year CBA suspension was imposed. After a two-year fight, PALEA and PAL forged a deal to settle the labor dispute of 2011 yet some 600 retrenched members have not been re-employed as provided for in the agreement. Today more PALEA members together with a contingent from PM will picket PAL’s main office at Macapagal Boulevard. Rivera said the protests this week are the start of a renewed campaign to oppose contractualization and outsourcing. Further Rivera argued that the latest round of layoffs is another expression of PAL owner Lucio Tan’s “no union policy.” He called for the solidarity of the labor movement and allied groups for PALEA’s continuing fight for regular employment. “Ang laban ng PALEA ay laban ng lahat. We call on our brothers and sisters in the trade union movement and supporters in the Catholic Church, student groups and NGO’s to close ranks for the struggle for labor rights,” Rivera stated. Media Advisory: PALEA @ 69: BACK TO THE STREETS!